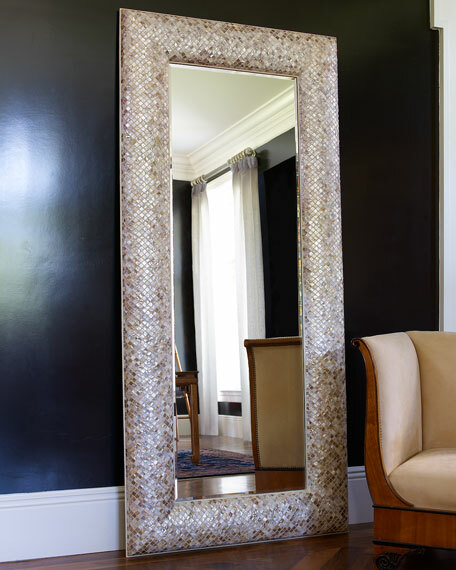 Mirror has mosaic frame made of mother of pearl. 40"W x 2"D x 87"T.
EXCLUSIVELY AT NEIMAN MARCUS Handcrafted, antiqued, silvered, and beveled floor mirror. Wood composite backing. For wall or floor display; hangs vertically or horizontally. 48"W x 1"D x 68"T. Imported. Weight, 97 lbs. Boxed weight, approximately 185 lbs. EXCLUSIVELY AT NEIMAN MARCUS This beveled mirror can be hung vertically or horizontally. Frame is created with hand-beveled mirrors surrounded by inner and outer beading finished in a heavily antiqued silver-champagne color. 20"W x 2.75"D x 40"T. Imported. Weight, 30 lbs. Boxed weight, approximately 35 lbs. Handcrafted of hardwood solids, laminated lumber, resin, and plated mirror glass. Hand finished in antiqued silver. Hidden compartment behind the center mirror allows for pocket storage of valuables. 48"W x 4.25"D x 82"T. Imported. Boxed weight, approximately 254 lbs.